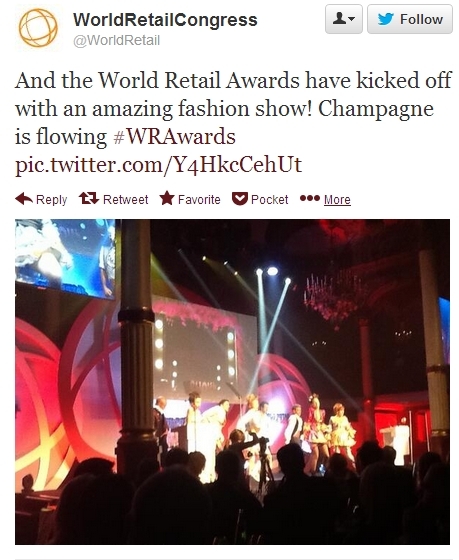 There were several European online shops rewarded with an award at the World Retail Awards 2013 in Paris. Tesco, Debenhams, Migros and Vente-privee.com were among the winners who went home with a prize. Awards were handed in categories like ‘pure play retailer of the year’ and ‘best new retail launch’. Migros, Switzerland’s largest retail company and supermarket chain, won the award for CSR Initiative of the Year. “This important and prestigious award honours the retailer who demonstrate that they are outstanding corporate citizens through on-going high standards but also a distinctive and effective initiative undertaken in the last twelve months.” Migros has a sustainable development programme with which it pursues concrete goals in five spheres of activity: consumption, environment, employees, society and health. F&F, a brand of British retail company ASOS won an award for Omnichannel Retailer of the Year. Parent company ASOS won an award for Retail Technology Initiative of the Year, because of its Fit Visualiser, an online tool which illustrates the size and fit of clothing online, helping the retailer to reduce returns, increase sales and improve the customer experience. Debenhams, which has an online store active in the UK, Ireland and Germany, won the award for Supply Chain Initiative of the Year, while the British multinational hypermarket Tesco went home with an award for Retail Advertising Campaign of the Year, thanks to its Christmas 2012 campaign. LVMH (Louis Vuitton Moët Hennessy), a French multinational luxury goods conglomerate, won an award for International Retailer of the Year, while Yves Carcelle from LVMH got the Outstanding Leadership Award, for turning “Louis Vuitton into one of the most powerful brands in luxury”.